Elegant texture, excellent balance. A born winner. Aroma: Varietal aroma reminiscent of citrus fruit, ripe peaches, melon, butter, vanilla and hazelnuts; complemented by an expressive bread crust aroma. Taste: Rich, but fresh and crisp. Elegant texture, outstanding mineral taste. An everlasting velvety finish. The “Goriška Brda” wine cellar manages 1000 hectares of vineyards that spread half-way between the Adriatic and the Alps. They truly believe in a sustainable development. For this reason the majority of their vineyards are included in our integrated system of vine-growing. In average every winegrower cultivates less than 2 hectares and thus takes care of each vine with devotion, resulting in a superior quality of grapes and wine. One of their leading principles is that quality is created in the vineyard. In the vineyard as well as the wine cellar they give particular attention to expertise which combined with the subtle and responsible monitoring of natural cycles grants customers safety and Slovenian quality. 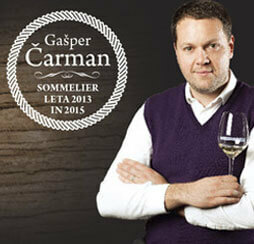 Director of the online shop eVino has won the Sommelier of the year twice.